With great insight, in later parts of the series, Brother Cedric broadened the topical range identifying and investigating the stratagem implemented by a growing number of police departments across the United States dealing specifically with increased surveillance – some would even say harassment – of Hip Hop artists and the peculiar treatment of crimes occurring within the Hip Hop community. Brother Cedric spoke with Final Call Assistant Editor Ashahed Muhammad about the relationship of those subjects to the global strategy of the infamous J. Edgar Hoover – whose plan was to stifle progressive activism within the Black community and to prevent the rise of a "Black Messiah." This interview was originally published in the July 19, 2005 edition of The Final Call Newspaper. Ashahed Muhammad (AM): Thank you for taking time out of your schedule. I know you are busy writing, publishing, being a consultant and political advisor, etc. I appreciate you taking the time to speak with me today. Cedric Muhammad (CM): Thank you. And it’s of course the greatest honor to be interviewed by the greatest newspaper on earth. AM: Dealing with Rap Cointelpro – some Hip Hop artists have faced an increasing amount of legal harassment including surveillance. Talk to us about what acted as a catalyst for your Rap Cointelpro series. CM: Well, actually, Brother Ashahed, I think the seeds were planted for the series when I actually worked in the music industry, in particular when I was General Manager for Wu Tang Clan, and in around 1996, we had an annual celebration called, "Park Hill Day," where we would bring out the residents of, in particular in the Park Hill Projects in Staton Island and we would treat them to games, entertainment, speakers, food and drink. There was a fight that broke out in one of these events and immediately the next day, I noticed the peculiarity of the media coverage, New York One, the cable news network in New York, The Staten Island Advance and the Associated Press had all projected what I thought was a strange and exaggerated picture of what happened and we discussed it internally a little bit. That was probably one of the signs that really showed me that there was an unusual amount of scrutiny on the Hip Hop community and Hip Hop artists in particular. I suspect, of course, those (artists) that are relatively more conscious than others. From that incident and from my background , I saw that if you were to make an analogy in terms of potential power between those in the ‘60s or ‘70s and those who are on the scene today, you would logically come to the conclusion that Hip Hop artists have the potential to raise consciousness and to activate political activity in this country at that same level. So, the rapper of today has the potential to do what the preacher and the activists did in the ‘60s and ‘70s, under the COINTELPRO program. And as a result, I drew the inference that those who feared the same type of revolutionary activity in the ‘60s or ‘70s, would naturally fear the same today. It may not be in the FBI. They may be under another intelligence agency and they may be private. They may be a privatized form of mercenary intelligence. So, that was what, kind of like was the premise in the backdrop from when I started the series in, I believe it was, the spring or summer of 2000. AM: You seem to indicate that the surveillance and the increased attention from law enforcement is aimed at the rappers who may have more of a politically conscious message. Can you give us some specific examples? And so, J. Edgar Hoover was fearful of any ideology or philosophy or charismatic leader or organization having access to a medium. And so, before we even get into the question of which rappers are more conscious than others, I think we have to respect the power of the medium itself. Hip Hop culture, the music and of course, radio, the records, the videos and other forms through which people can project messages and images that may spark a movement. Now, in the specific sense, I believe I began writing on the murders of Biggie and 2PAC, because of two very simple facts that I think are glossed over and those facts are: that at the very time of their murders, in the case of Biggie in particular, but in the last days and weeks of their lives it is a documented fact, it has been reported that both 2PAC and Biggie were under government surveillance by federal agencies. He talked to me when I used to meet with him and visit with him in Alexandria, VA about, what he called, "a cover story." And the cover story is what the people in Black operations write to cover up what it is that they’re really trying to do. And the media is part and parcel of the cover story. I saw propaganda put out against my old group, Wu Tang Clan and these Village Voice articles that would link them to illegal activity. I was there for 3 years and I know it wasn’t true. Then, I was told that individuals arrested on certain charges in New York City were being offered less time if they would say that they were doing what they were doing on behalf of Wu Tang Clan. That was kind of like the early anecdotal evidence that I looked to that gave credence to the pieces that I was trying to offer regarding Hip Hop artists being unique targets of federal and local agencies. AM: As one who has watched this develop what would you identify as the main reason for the increase targeting of Hip Hop artists? You mentioned the political aspect of it, however, is any of it because of the level of visibility and is it financial as well? CM: Well, let’s start with their own words. Right around the year 2001, 2002, the New York newspapers and then MTV, began to report that there did exist inside of the New York police department a special unit devoted just to the Hip Hop community. They tried to deny it at first, and then eventually, the New York City police acknowledged that it was factual. Their own position is that there is a unique level and peculiar level of violence in Hip Hop music and in the industry, and that there are ties to street organizations that warrant special attention in order to prevent feuds from taking place, extortion, acts of violence, and murders. That’s what the New York police department has said and then, as you know brother, it came out last year in the Miami Herald, Nicole White, Evelyn McDonald and another sister wrote an article exposing that the Miami Beach police department kept 6" thick dossiers on Hip Hop artists that came out of New York that stayed in Miami. The Miami police gave the same reason that they were concerned about the safety of the artists and therefore they had to pay special attention to them. But what wasn’t reported and didn’t come out is that the letterhead for the documents in this dossier that the Miami police had, were from the DEA. Is this really about protecting artists when you have DEA letterhead involved? And then, I want to really emphasize this brother, because I have to say I was one, to the best of my knowledge I’m the only one that actually wrote about these hearings the way I did. In the year 2000, I was actually present at Congress for the hearing surrounding the Rap A Lot investigation. The Houston police department, the IRS, the DEA and the FBI, all had James Prince and the rapper Scarface and really the whole 5th Ward of Houston, under surveillance, in their hearings. I’m sitting right there. They’re giving me paperwork. I’m actually able to see who the undercover agents were. They admit that they had close to 400 informants inside of the 5th Ward that were related to this investigation. So, I think eventually they arrested Scarface on some possession of marijuana charge. Does that really warrant 400 informants and FBI, DEA, the IRS? I just want to give you their rationale so you can start to see some of the holes and some of the red flags that should go up when agencies say they’re trying to protect Hip Hop artists and yet, in the case of Notorious BIG when they’re literally following him at the time that he’s shot, they can’t point you to a suspect. 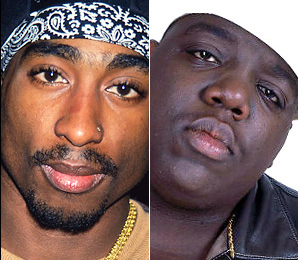 There’s been no conviction in the murder of 2PAC or Biggie. AM: It would be extremely naïve to think that if they had the 400 agents and officials in Houston, that this wasn’t being duplicated in some way in other major markets where you have many rappers who live and conduct business. Is that correct? CM: Yes. And the context for that is J. Edgar Hoover. I think in the ‘60s he had, I think 3,300 informants. They called it "the ghetto listening post." "The ghetto listening post," was an informant program that the FBI ran to get people in the inner cities to infiltrate Black, progressive organizations. So, it’s the same, the tactics are absolutely the same, if you look at this. But I think the smoking gun, so to speak, came last year with the Miami investigation and some of the questions that the police were not able to, and the DEA were not able to answer. And some of those questions were not posed properly but again, I did not write the series saying that I was going to definitively prove anything. I just said that I was raising some questions and as I wrote, with each passing year, more and more evidence came to support the validity of the thesis that I put forward. AM: What responsibility do the rappers have to try to keep themselves out of the legal system? CM: …because of their level of visibility but I don’t share the view of many people who believe that the rappers are getting what they deserve and that our people are getting what they deserve when they get caught up in the criminal justice system. AM: There’s a precedent throughout history for Italians and Jews, the Irish taking ill-gotten gains or what could possibly be considered questionable gains from financial dealings and investing in legitimate businesses. Is there a precedent within Hip Hop for this? From the perspective of being a commentator on these types of issues, do you think this is positive or negative? CM: Well, it’s a great question. I think a point of reference in Hip Hop would be for us to listen to "Drug Dealer" by KRS-One. KRS-One dealt forthrightly with the historical context in which immigrant and ethnic communities have taken revenue and wealth that they’ve created illegally and then transferred that into a legal, worthwhile organizations, businesses and forms of employment for their own. It’s happened with the Jewish community, the Irish community, the Italian community. I can run down the list of ethnic kinship systems that revolved around illegal activity and then eventually over time, there was a transition into what’s called legal activity. This is nothing new. Economists study it all the time. People can look at a very good book,"History: The Human Gamble," by Reuven Brenner. He has written another book called "Labyrinths of Prosperity," that deals with these dynamics and I think it’s very instructive when you look at some of those who may have been convicted criminals or may have been street entrepreneurs who took that money and then put it into the entertainment industry. AM: There seems to be a pattern of these large business empires being brought up on RICO charges tying them into this and that. Other than of course having the correct documentation and attention to detail, what ways can the artists insulate and protect themselves from this legal harassment? CM: Well, back on the responsibility point, I think at a certain point the artist has to be honest with what image they project. If you’re a wealthy artist, then you’re getting your money from legitimate business activity, why would you continue to promote, street hustling? Certainly, the hustling mentality is worthwhile as far as the entrepreneurial spirit but if you have a clothing line, you have a barbershop, you have a record label, why would you keep pointing your brothers and sisters to selling crack? What artists should do to protect themselves, is to watch what they champion and value and place in their music. Second thing is, artists really need to connect with their communities. They need to connect at a very grass roots level with their social organizations, their religious institutions, their grass roots organizations, their educational systems, because if you really are a boss or a mayor and are trying to aspire to be a power broker, you have to be firmly rooted in your community. I think artists would find that they would get out of trouble a lot quicker if they had the full weight support of their community and certain institutions and opinion leaders in support of them. Being righteous, being plugged into the proper institutions, making the right donations even, making the right moves and building a strong team of advisors around you is probably the best protection for a Hip Hop artist. AM: Alright, very good Brother Cedric. CM: Thank you so much, Brother, it’s an honor. 1. Cedric mistakenly referred to the March 4, 1968 memo in the interview. The statement regarding a 'mass communication medium' is actually contained in a memo dated August 25, 1967. According to a declassified May 14, 1970 memo written by G.C. Moore; the August 25, 1967 memo and the March 4, 1968 memo constitute the initiation of the Counterintelligence Program. 2. Col. Fletcher Prouty spent 9 of his 23 year military career in the Pentagon (1955-1964): 2 years with the Secretary of Defense, 2 years with the Joint Chiefs of Staff, and 5 years with Headquarters, U.S. Air Force. In 1955 he was appointed the first "Focal Point" officer between the CIA and the Air Force for Clandestine Operations per National Security Council Directive 5412. He was Briefing Officer for the Secretary of Defense (1960-1961), and for the Chairman of the Joint Chiefs of Staff. 3. Cedric Muhammad wrote an E-Letter To The Miami Herald as part of this Rap COINTELPRO series.